Born in 1964, lives and works in Budapest. 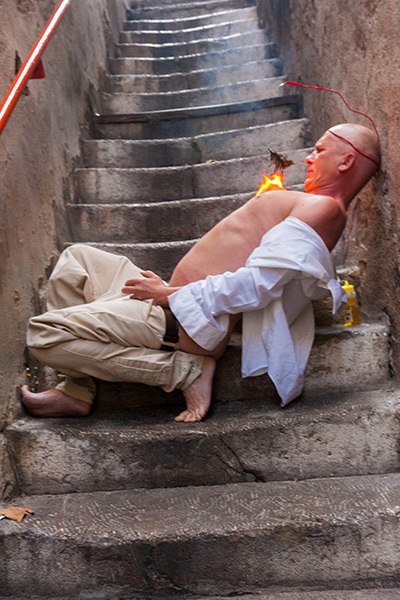 István Kovács has worked with performance art for 24 years and is known as one of the major performance artists from central Europe. In his work Kovács focuses on the physical body, the flesh and blood, life and death, without forgetting the role played by the mind. His work may be physical, he can be naked, and his body covered in paint or wrapped in materials such as plastic film, or cellophane, but his work always have a conceptual stance. Creating live images with an existential twist, Kovács analyzes the implications of being human, of life, birth and rebirth. He gives focus on how contemporary man relate to these fundamental issues interacting with artificial as well as natural materials. Humour and irony is often part of his very large and liberating palette of expression. Istvàn Kovács. Infr'Action Sète. © Roland von der Emden & Infr'Action.